If You're Scared Of Math, Your Kids Might Be Too A new study shows that creating an environment in which math is part of everyday life, can help kids do better in the subject. But for kids, math anxiety isn't just a feeling, it can affect their ability to do well in school. This fear tends to creep up on students when performance matters the most, like during exams or while speaking in class. One reason for a kid's math anxiety? How their parents feel about the subject. "A parent might say, 'oh I'm not a math person, it's okay if you're not good at math either,' " says Sian Beilock, a cognitive scientist and president of Barnard College, says. "It can send a signal to kids about whether they can succeed." But new research from Beilock and her team shows that parents don't have to overcome their fear of math to help their child succeed, as long they changed their attitudes about the subject. The researchers gave families in the Chicago area math-related bedtime stories to read at night, through an iPad app called Bedtime Math. The stories featured fun facts about walking frogs or the world's largest cupcake. After reading the stories with their parents, kids answered questions about what they just read, practicing simple addition or measuring the amount of an ingredient. Families did this for a total of three years — while kids grew from first to third grade — because this is when kids tend to solidify their fear of math. After a year of reading these stories, parents felt more confident in their children's math potential and valued the importance of math skills more. Now, after three years, when those students were tested on their math ability, they did just as well as the kids whose parents felt confident about math. One caveat: Two years into the study, families rarely used the app (less than once a week) and parents still felt anxious about their own math skills. 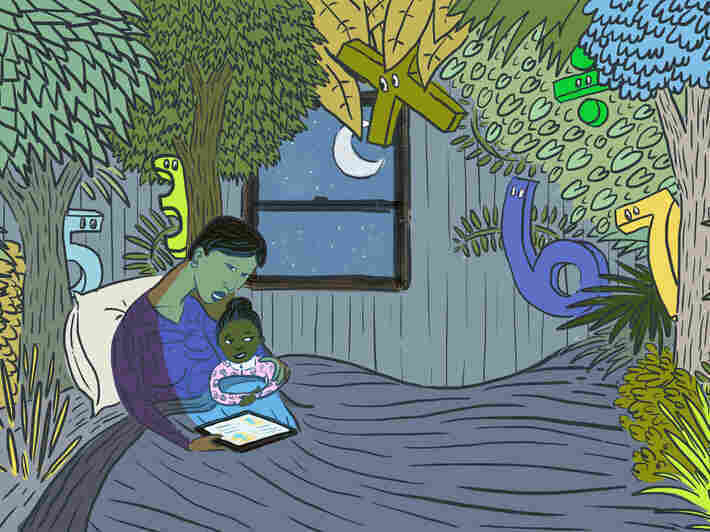 Using the app to read bedtime stories didn't get rid of math anxiety — it was a way for families to normalize math at home and foster a relaxed dialogue around the subject. There's more than one way to do it: Beilock suggests other fun activities like puzzles and cooking give families an opportunity to talk about math. Creating an environment in which math is part of everyday life won't transform kids into overnight math sensations, but perhaps it can help kids realize math is a subject for curiosity, discussion and growth. "It's almost socially acceptable to be anxious about math," in a way that doesn't apply to reading, Beilock says. But early math skills form an important foundation for academic success and have predicted achievement later in school, including reading skills.